Danni Laura: Glossybox VS. Birchbox, July 2018. I think I've made my feelings on these two subscription boxes pretty clear. Glossybox is my favourite and Birchbox never seems to measure up. But could this be it, could this be the month that all changes? So, Birchbox costs £10 a month plus £2.95 delivery with hermes (who as always are crap. Why bother ringing the doorbell when you can just throw it through an open window?! Is it any wonder so many people have complained about the powder being broken this month!) The box has changed from this month, so instead of a drawer style, it's now the same style as Glossybox, only smaller. There's 5 products inside, one full size. The only full size product is the Manna Kadar Long-Wear Powder in the shade Paradise (RRP £15). This was the product subscribers got to choose this month, but I picked the suprise me option. This is a dark coral blush with a hint of gold shimmer, it reminds me of Sleek's rose gold blusher. Being totally honest, this is one of two products I'm happy with. Next up if a sample of R + Co Badlands Dry Shampoo Paste. Kudos here to Birchbox finally sending me a hair product I'll get some use out of! Usually they send me ones for dry hair, when my profile is marked as oily hair so this was nice for a change. But it's such a tiny little tub, it just isn't enough to try it properly. The only body product comes in the form of the What's in it for me..? Shower Scrub. This is another product I'm happy with as I love a good shower scrub. This would be an ideal travel friendly size too. The first of the two skincare items is Klorane Floral Water Makeup Remover. I'll probably get two uses out of this tops but again, I'll use this when travelling. The last product is the Balance Me Congested Skin Serum. This is the product I'm most annoyed about. As this is a sample, it doesn't say what skin it's suited for but it you look on Birchbox's website, the fullsize bottle says its for oily acne prone skin. My profile is marked as dry skin so I'm annoyed that I've even been sent this. I've had items sent for the complete opposite of my beauty profile on multiple occasions now and it's getting a joke now. I'm not happy with Birchbox and without a doubt, once my year subscription comes to an end, I won't be renewing. Glossybox also costs £10 a month plus £3.25 tracked delivery with Royal Mail. There's five products this month plus an extra sample. The first product is the Senhor Do Bonfim Sea Water Hair Spray (full size RRP £16). While I'm not a big fan of receiving hair products in beauty boxes, this one is a welcome addition. I've never used a saltwater spray before but I'm looking forward to trying it out. Next up is Crabtree & Evelyn La Source Hand Therapy (full size RRP £8). I always need more hand cream as my hands are so dry and this is an ideal size to throw in a handbag. It smells really nice and fresh too. We've got a make up product with the Oriflame THE ONE 5-in-1 Wonder Lash Mascara (full size RRP £9). This sounds ideal as it's supposed to lift, curl, volumise, lengthen and seperate lashes. I haven't tried it out yet as I have a few other mascaras to get few first before opening another. That cute brush is the Inuwet Cheek Shell Brush (RRP £13.20). I'll be using this to contour with. There's also a deluxe mini of Regenerate Enamel Science Advanced Toothpaste. This is the first toothpaste of it's kind as it regenerates enamel and reverses erosion. Sounds good to me! The extra treat is a sachet of Hawaiian Tropic Duo Defence Sun Lotion SPF30. This provides an anti-pollution layer as well as UV protection but I'm more of an SPF50 girl myself! I'll keep this as a backup as I'm going through sun lotion like nobodies business. 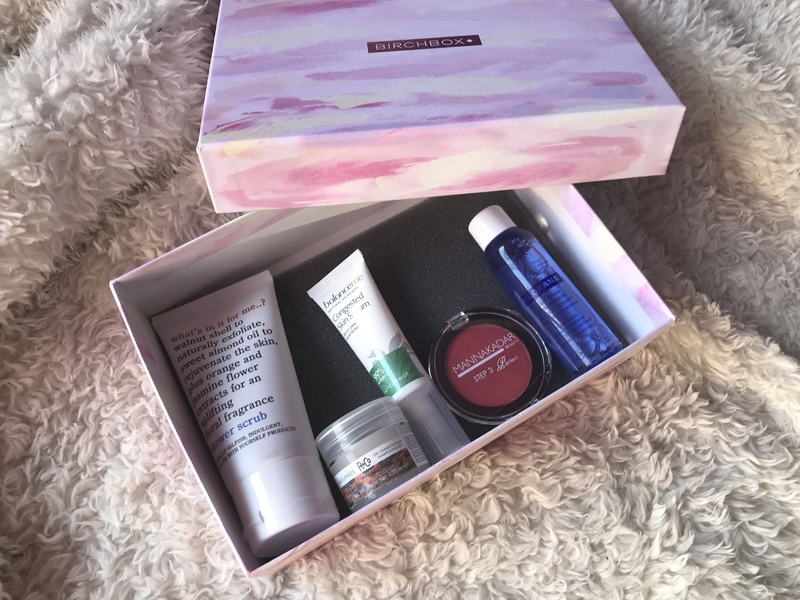 Surprise, surprise, I prefer Glossybox over Birchbox again. I like the sneak peek for both boxes as Glossybox will have an eyeshadow paint next month and Birchbox will have an eyeshadow crayon. Do you get either of these? Which do you prefer? I think I need to start subscribing to a beauty box again soon.. I miss it!